Brokk, the world’s leading manufacturer of remote-controlled demolition machines, introduced the Brokk 200, a new weight class of machine. The new model packs the power of a 3-ton Brokk machine into a 2-ton package. The Brokk 200 was one of four new next generation remote-controlled demolition machines Brokk showcased at World of Concrete 2019 in Las Vegas. 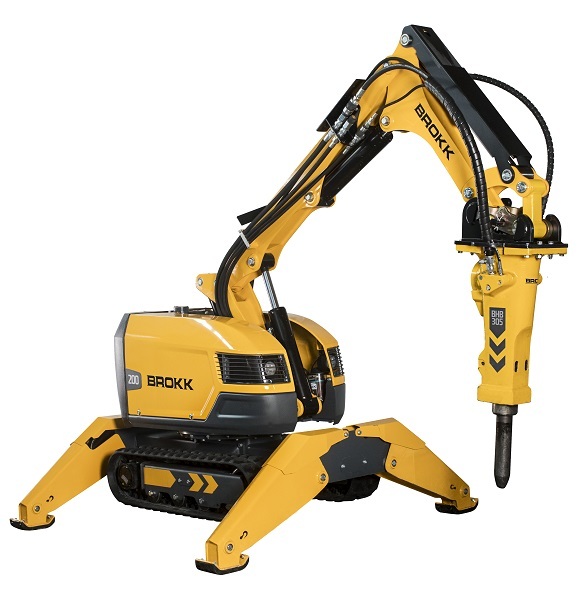 The machine comes equipped with Brokk’s signature SmartConcept technology for increased efficiency. SmartConcept includes the extra power of SmartPower, the added reliability of SmartDesign and enhanced ergonomics and productivity of SmartRemote™. The 27.5-kilowatt machine operates tools with requirements typical of one weight class above. When paired with the new Brokk BHB 305 breaker, the unit’s hitting power is increased by 40 percent. The new class of machine delivers 450 ft-lbs (610 joules) with each blow of the 650-lb (295-kilogram) hydraulic breaker. Click here for more news from Brokk.